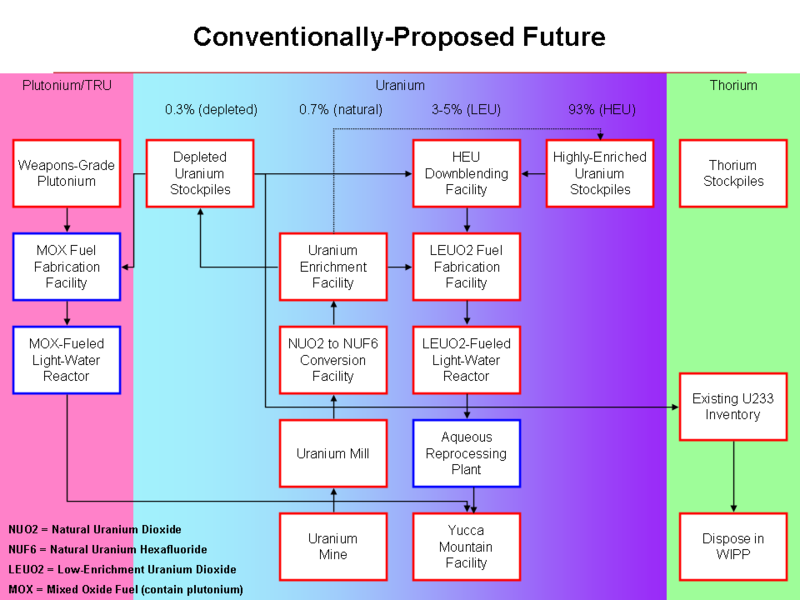 Since giving my talk at TEAC2 several weeks ago on my proposed plan for our nuclear future, I’ve been spending a lot more time thinking about this issue, the plan, and how to describe what I would propose to do. Sometimes it helps me to sort out thoughts by drawing a picture, but in this case, as I sketched out my plan, I found that I needed to sketch out descriptions of how nuclear operations have been conducted in the past, how they are conducted currently, and what the conventional view of our nuclear future is. First of all, let’s consider the period right after World War 2. That may seem like a long time ago, but decisions were made then that still have ramifications to this day. In that time period, stretching from the late 40s until well into the 1960s, the overwhelming concern of the US Atomic Energy Commission (USAEC) was to produce weapons-grade plutonium and weapons-grade uranium for use in nuclear devices. Producing electrical energy from nuclear power was way down the list of priorities. Here’s a sketch of how things worked back then. They would mine uranium and process the ore at a mill. Then some of the ore would be converted from natural uranium dioxide (the form it’s in in the earth) to uranium hexafluoride (UF6), which is a gas. When I say “natural” in these descriptions, I generally mean its isotopic consistency, in other words, that the proportions of U-235 and U-238 are the same as those found in nature (0.7% U-235 and 99.3% U-238 respectively). So the NUF6 (natural uranium hexafluoride) would be enriched in a huge enrichment plant. Some of the first of these were in Oak Ridge, Tennessee, but later facilities were at Portsmouth, Ohio and Paducah, Kentucky. At these enrichment facilities, the composition of the uranium was changed at incredible expense. Most of the uranium ended up “depleted”, which means it has less U-235 than when it started. Some ended up “highly-enriched”, to the point where the uranium was nearly all U-235. Another path was taken to make plutonium. This time, natural uranium was loaded into special heavy-water reactors at places like Savannah River that would lightly irradiate the uranium (I sometimes call it “toasted” uranium) in order to convert some of the abundant U-238 into plutonium-239. This plutonium was then separated chemically at an aqueous reprocessing facility and used for weapons construction. 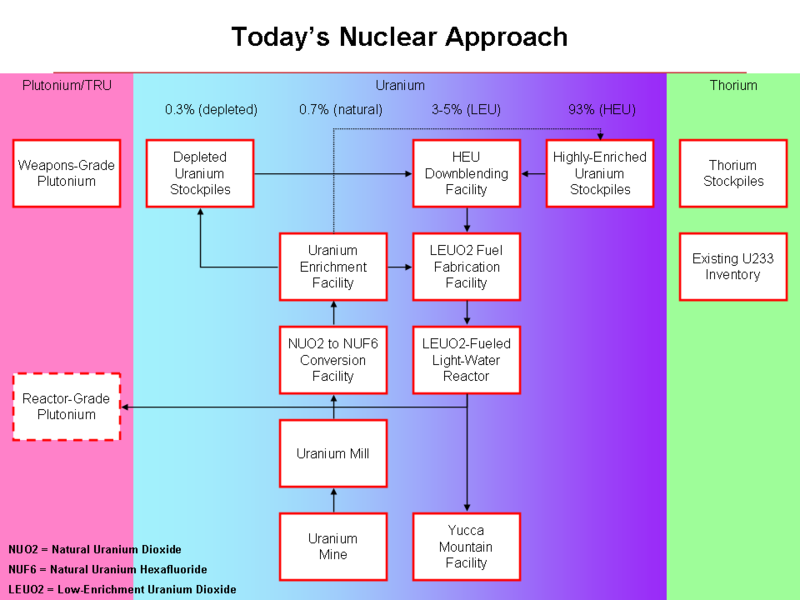 Then we can take a look at how the nuclear approach looks today. We still mine uranium and enrich it, but now the enrichment level isn’t as high as is needed for weapons. Our reactors (at least in the US) don’t use “highly-enriched” uranium, they use low-enrichment uranium (LEU). It’s still produced in those big enrichment plants at great expense though. So we make LEUO2 fuel (low enrichment uranium oxide) and stick in our light-water reactors. As the fuel “burns”, plutonium is produced, but it doesn’t have the same composition as the weapons-grade stuff. It’s called “reactor-grade” plutonium. We also have a lot of highly-enriched uranium that’s coming from the decommissioning of nuclear weapons. In a bizarre waste of energy, this HEU is being “downblended” with depleted uranium to also make nuclear fuel for light-water reactors. The energy investment originally required to make HEU was titanic, so downblending it is not my favorite idea for what we should be doing, but it’s what we’re doing nonetheless. As you can see from the graph, our weapons-grade plutonium isn’t currently being used, and our small U233 inventory is sitting there too. We have a huge inventory of reactor-grade plutonium in our spent nuclear fuel, but the current plan (and it’s still law until they change the law) is to send it to Yucca Mountain. Well, that doesn’t make any sense because Yucca’s been cancelled, right? So we turn to our next slide about the “conventional” view of our nuclear future. In this approach, we take the weapons-grade plutonium we have from decommissioned weapons and we make “MOX” fuel out of it. MOX stands for mixed-oxides, and it means that you have a fuel that is formed from plutonium and depleted uranium, and you mean to burn it up in a light-water reactor. Like LEUO2 fuel, you can only get part of the energy out of the MOX fuel that’s in there, so running it through the reactor doesn’t release all of the energy of the plutonium. But it does degrade it, probably enough that it’s no longer weapons-grade but now reactor-grade. Our small U233 inventory, as I have bemoaned so many times, is slated for destruction in this scenario by mixing it with depleted uranium and burying it somewhere, probably in the Waste Isolation Pilot Plant (WIPP) facility in New Mexico. It’s also possible that we might use aqueous reprocessing to recover reactor-grade plutonium from our light-water reactor fuel and make more MOX out of that, although the prospects for doing in this in the US aren’t so likely. France is doing this right now. In this scenario, we still need a Yucca-Mountain type facility. We may reduce the need somewhat, but it’s still there. Finally, we reach the scenario I propose, which is an attempt to completely destroy our weapons-grade plutonium and HEU while at the same time kick-starting our thorium-powered future into high gear. In my proposed scenario, we use the weapons-grade and reactor-grade plutonium in a liquid-chloride reactor. The liquid-chloride reactor can completely burn this stuff up, and if we jacket the reactor with thorium, we can make new U-233 to start all the LFTRs that we need to build to get energy independent. We also stop downblending of HEU but use instead to start special versions of LFTR that are intended just to make more U-233. So these special LFTRs will live on a diet of HEU and produce U-233 in their blankets to start other LFTRs. We take all of the spent, exposed uranium oxide fuel (XUO2) that our light-water reactors are producing and we fluorinate it. Most of it will come out as UF6 that we could send back to the enrichment plant if we want. The transuranic waste (TRU) which is mostly plutonium is sent to the chloride reactors to be burned up. To make all of this happen we’re going to need a lot of fluorine to make all this fluoride salt. The average LFTR fuel is over 50% fluorine by weight. Here’s a chance to kill two birds with one stone. Most of the uranium we’ve ever mined is sitting outside of the enrichment plant in barrels as depleted uranium hexafluoride (DUF6). Each of those uranium atoms is locking up six fluorine atoms. Furthermore, disposing of depleted uranium in this chemical form (UF6) is a really bad idea. UF6 is chemically unstable, because the uranium is just barely holding on to those last two fluorine atoms. UF4 is much more stable, and UO2 is more stable than that (in nature). So we need to convert all of that DUF6 to DUO2 and recover lots and lots of fluorine. The recovered fluorine is then used to fluorinate spent uranium oxide fuel from light-water reactors, and to form new fuel and blanket salts for all the LFTRs we will build. Once DUO2 has been produced from DUF6, it could be disposed on in the same mines from whence it originally came. It will never be as radioactive as natural uranium (and its decay products). In the scenario I lay out, the U-233 is precious, and we stop all efforts to destroy it. Rather, we want to make much more of it. We want LFTRs burning up HEU to make U-233. We want chloride reactors burning up plutonium to make U-233. Uranium-233 is the constraining factor in our thorium expansion because we have so little and we need so much. The thorium itself will be easy to come by, provided that we begin to mine for rare-earth elements again, and stop relying wholly on Chinese imports. Thorium is always found with rare-earth elements, and will be available in large quantities for essentially no cost. They may actually even pay us to take it! 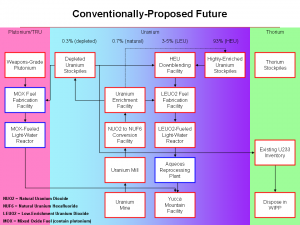 The goal of this plan is to address all of the heritage HEU and plutonium both from our weapons-program and from light-water reactor operation, as well as to get us off of fossil fuels and running on thorium. Another goal of this plan is to eliminate the need for a Yucca-Mountain style repository. I think it can work! What do you think? To be clear, I think it may be feasible to have a U233 plant with sufficient security that people won't freak out about it having theoretically weapons grade uranium, but I don't think we're going to avoid downblending of decomissioned nuclear warheads, it's just politically impossible. Thanks Jaro, I read both the initial Report of the Expert Review Panel on Medical Isotope Production and the Government Response you linked to. It spells the end of high-flux neutron research in Canada, including CANDU development. As for the Nuclear Security Summit, I had a great deal more to say about it in a guest post over at Brave New Climate if anyone is interested. My remarks drew some heat from the usual suspects, as was to be expected. Sorry, I had a senior moment there and forgot I already posted the link. "It spells the end of high-flux neutron research in Canada, including CANDU development." However, that is so only because various types of CANDU fuel bundles require lots of irradiation testing in a reactor like NRU. Lots of people make thrir living doing that — and running all sorts of sophisticated analyses of bundle shuffling modes in a CANDU. Guess what happens when you go to liquid fuel instead (…of course I don't expect anyone in charge to guess the answer).
" The fact is any proposed break-even pure Th-U233 design has provisions to process out and recycle the small amounts of transuranics produced (or they also need Yucca Mountains by that logic). In startup on LEU we simply use the same methods to process and recycle a few years worth of operation of the fuel salt until one switches to running off U233 (and the recycled transuranics from the first fuel salt). Thus all the transuranics also get eventually consumed. Even including the standard 0.1% processing loss, we would likely lose less TRUs to waste if we only did the process once after the 1 to 5 years needed (versus processing smaller amounts of TRUs but more often in the pure Th-U233 cycle) "
I think this is a very important (and interesting) point. If I understand it correctly, a DSMR using LEU produces less TRU waste than a breakeven thorium/U-233 breeder, can you comment and deepen it ? 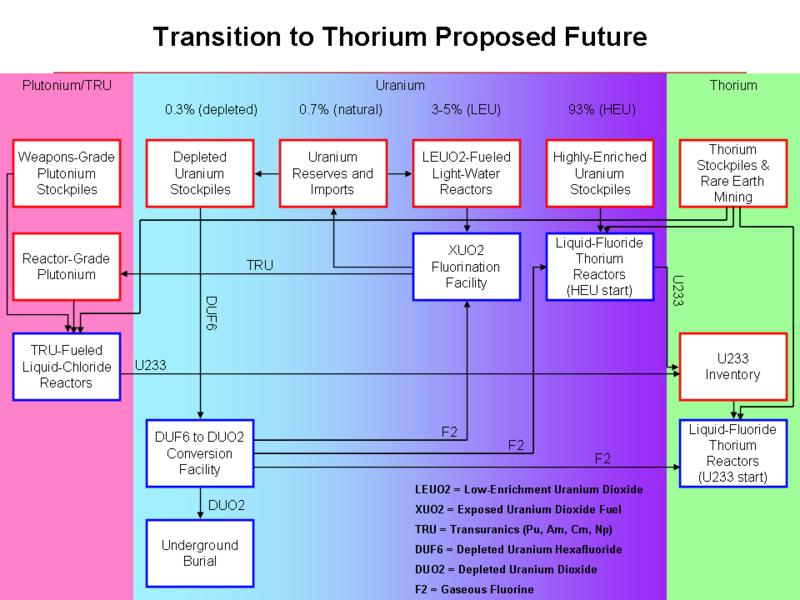 Does it change something in the case of an unmoderated epithemal/faster spectrum thorium breeder ? It is the new recommended strength for research reactors. It can be blended with thorium for high burn up fuel. It can be used as a fast reactor fuel. The Russian prospective design SVBR-100 uses less than 20% LEU. It can be used as initial fissile feed for LFTR. It can be blended for small reactors with thorium for high burn up fuel. Blending for thermal reactors can be denatured or as separate LEU pins/bundles. Even in the LFTR, the 20%LEU could be as SiC lined pebbles providing fissile feed to liquid thorium solution. Thorium could be in the coolant fluid. There's another thing that 20% enriched fuel does in a reactor. 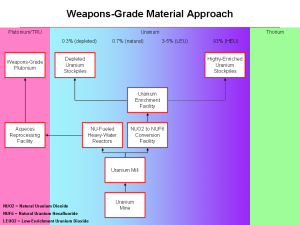 So if the IAEA calls HEU "weapons-grade" material, which it certainly is, and calls all classes of plutonium "weapons-grade" which they may or may not be, what have you accomplished by using downblended uranium? You're still making plutonium. The current attitudes about contoling the HEU supply has several depressing parallels with abject failure of the attempt to control the use of narcotics by attacking the supply. Nether seems to recognize that sufficient demand will find a way to be supplied, and both fail to address the underlying issues that drive the demand in the first place. Ultimately just as marijuana is being kept from those with a legitimate need, the development of nuclear power will be restricted by these policies. Shallow thinking and unwarranted fear strikes again. I like the diagrams although there are a few lines that are not immediately obvious to me. Here is an idea to improve the document. Each diagram gets progressively more complex. I was expecting a final diagram where uranium is not used at all. A diagram that is much simpler than any that proceed it. I realize that a total thorium fuel cycle world would need to be 80 to 100 years away, but you are trying to establish a vision with this paper. The last diagram would have nothing in the violet region and nothing in the blue-purple region! Just one more simple diagram would complete a very powerfull vision. Martin, you are right. 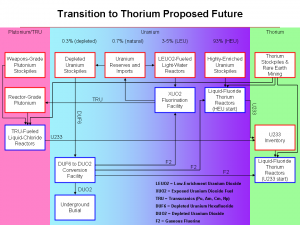 The final, steady-state vision would simply show thorium proceeding into LFTRs. This final vision would be realized when all the plutonium and HEU had been burned up, and all the LWRs replaced. That's probably about a century away, but would last for tens of thousands of years after that. If I understand it correctly, a DSMR using LEU produces less TRU waste than a breakeven thorium/U-233 breeder, can you comment and deepen it ? Does it change something in the case of an unmoderated epithemal/faster spectrum thorium breeder ?" To broaden that comment, a DSMR using LEU likely will produce less TRU waste than a thorium/U233 breeder (or quite similar amounts). A DMSR like Oak Ridge proposed in 1980 will produce TRUs at a higher rate but they are very quickly fissioned off within the salt so they never build up to very high amounts (about 1000 kg in the salt after 30 years). One can then process the salt one time and recycle these. If a common assumption of 0.1% loss is made that works out to 1 kg in 30 years. For comparison, a Thorium/U233 breeder will produce TRUs at a slower rate but they also build up (perhaps to a few hundred Kgs in the salt if always recycled back into the same salt). However to break even on breeding this salt must processed to remove fission products every few months to maybe a year (even longer for a very hard spectrum like the French propose). Thus over a 30 year period they might try to remove and recycle 300 kg of TRUs 30 to 100 times with a similar 0.1% loss each time. The losses in both cases are very small compared LWRs (even with MOX use) but it is very surprising how good the DMSR case is (they didn`t care about this during development in the 60s and 70s). In so far as how it changes in a harder spectrum (say like the French TMSR, now called MSFR). Running a DMSR without graphite is probably not the way to go (too many reasons to get into here, it is still a possibility though). If you did run a DMSR with a harder spectrum you will get a lot more TRUs built up in the salt because their cross sections for fission and absorption will drop. So this method will certainly mean more TRUs going to waste if we process with the same regularity (10 to 30 years?). For a thorium-U233 break even design like the TMSR with harder spectrum, they end up having several times as much TRUs in the salt if they recycle so they lose more each recycle BUT they don`t have to recycle nearly as often, perhaps even down to every several years and still break even. Overall it likely works out about the same for the TMSR. Hope that explains things better. Is that " 1 kg in 30 years " the transuranics waste produced per GWyear of electricity production ? Yes, I forgot to put in that my numbers were all assuming the standard 1 GWe plant size. I use ORNL data as a guide and to be specific they assumed a 75% capacity factor (so 30 years is actually 22.5 GWe years). So 1 kg TRUs lost during recycling in 22.5 full power GWe years is on the order of 40 grams per GWe year. At this rate, and adding in the long lived fission products we actually are left with LESS long lived radiotoxicity than would be consumed by the reactor in the first place (ie.e the natural U234, U235, U238 and thorium consumed). So after a 300 year wait for the short lived fission products to die down, we actually would have made a net reduction in the earth`s radioactivity. Before someone beats me to it, I should add to my last comment that the very low long lived waste production assumes we continue to use all the uranium produced. We`ve had discussions of this in the forum. Short review is that for ORNL`s DMSR design you "might" need to re-enrich the uranium every few decades which is problematic due to U232 contamination but if you run only LEU without thorium it is straight forward to re-enrich and keep consuming any lighter uranium isotopes. Just curious, is it wrong to say that the TRUs waste density is in the range of 10 kg per liter ? For example, supposing a mid size country wants to produce about 60 GWyear per year (~ 520 TWh/year) of electrity with DMSRs per 100 years, or 6000 GWyear. At the end, it will produce only some tens of liters of TRUs,specifically less than 30 liters, or am I wrong ? That sounds reasonable although I am not sure the density of PuF3 etc, my guess is a bit less than 10 kg per llter. However, the only waste TRU is that which slips out with the fission product waste stream so it isn`t really like we can group the TRUs together. As well that level of 0.1% lost is only an estimate, likely the more money you spend, the lower you can get this number. The folks promoting the IFR fast breeder (sodium cooled) aimed to get this same number of 0.1% loss during recycling but found it likely extremely hard to do better than 0.5% (depending on who you ask), in practice I heard it was as bad as 3% and they would need to process orders of magnitude more TRUs than a DMSR. In public they often just assume it is 0% loss and thus claim no TRUs going to waste. why do you believe the TRUs recycling efficiency is so much higher for LFTR than a system like the IFR ? I am just going by results to date. Oak Ridge did many trails of removing Pu and typically got high removal rates at least for their fluorination methods (but was a corrosive operation). Np is very simple to remove at a high percentage (it fluorinates out with uranium). I`ll be honest I am not sure their results for removing Am and Cm which they proposed to do by liquid bismuth reductive extraction. In the case of IFR, their method involves pulling out the transuranics by depositing on an electrode. They couldn`t seem to get it all to come out of solution. I know at least one expert who claims if they just spent more money they could improve the percentage lost but independent reviews do comment on their lack of ability to get below 0.5 to 1% loss and not meeting their goal of below 0.1% loss. When you have to process tonnes of transuranics in the IFR case (per GWe year) the percentage lost to waste becomes much more important. A DMSR type reactor can certainly be started up on Pu or LWR wastes as well. In fact, the ideal way to start them is a mix of low enriched uranium and a bit of LWR transuranic (with or without thorium). In terms of trying to burn off the very small amount of transuranics I quoted (about 40 grams per GWe year), this waste is just the tiny bit that gets slips past the recycling operation when you finish a batch of salt (every few to 30 years). If one were to pay huge sums to even try to collect that little amount, it would be simpler to just throw it back into another DMSR.